The rockabilly music lowered as Ace Cafe Orlando Chief Marketing Officer Steve Glum walked onto the stage where punk rock legends The Ramones once played. The audience who gathered for a special preview event on the evening of May 18 welcomed him with applause in spite of the drinks in their hands. "It's not lost on us that it's taken awhile to get here," said Glum, referring to the delays, stoppages and longer-than-anticipated wait for the London-based motor culture-themed eatery to realize its first North American location. "But it's all been worth it." 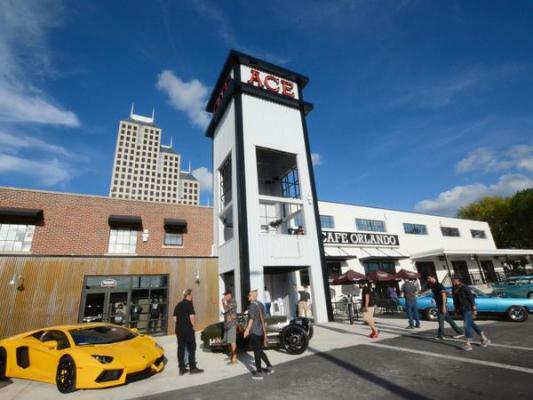 The signs are lit, the cars are parked and the doors are open as London-based Ace Cafe celebrates the opening of its first North American location at 100 W. Livingston St. in downtown Orlando. Just four years earlier, the historic-yet-dilapidated Harry P. Leu site at 100 W. Livingston St. won over George Tsuchnikas, operations director for Ace Cafe London, and Mark Wilsmore, managing director of Ace Cafe London, while they were in town scouting locations. "We saw this old building, falling apart," Tsuchnikas told Orlando Business Journal. "And it was perfect. It had the railway nearby, the road nearby — it was't for sale, but we had to have it." The rehab of the 91-year-old property — which formerly housed The Edge concert venue in the 1990s and, later, the H2O Church — included everything from a new roof and air-flow system to a new kitchen and patio. The end result is Orlando's newest entertainment complex. Phase 1 of the project, opening on May 19, includes a 14,000-square-foot restaurant space featuring bars, lounges and a stage. Next to the restaurant is 18,000 square feet of retail space that features a motorcycle dealer, a motorcycle safety gear retailer and the Stonebridge Motorgallery fine art gallery. A second phase, scheduled for completion in the fall, will include an outdoor concert venue, indoor event space and an Oklahoma Joe's BBQ location. The venue will officially open to the public at 7 a.m. on May 19 with service at the grab-n-go coffee bar and special events all weekend long. Daily lunch and dinner service and a weekend brunch menu will be part of the post-grand opening routine. Click here for the list of grand opening weekend events.